Obituary for James Singleton | In Memoriam Funeral Services Inc.
Peacefully passed away at Headwaters Health Care Centre on Friday March 15, 2019 at the age of 77. 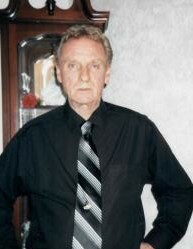 Predeceased by his loving wife Pat; beloved Dad of Mike (Barb), Jim (Julie) and Chris (Lisa); cherished grandpa of Amanda, Chance, Kyle, Eddy, Jack, Connor, Danielle and Scott; proud great grandpa of Juliette, Eric and Landon; loved brother of Gloria and predeceased by Beatrice and Dave. James will be missed by many other relatives and friends. A Memorial Visitation to celebrate James’ life will be on Friday March 22, 2019 from 1:00 p.m. to 3:00 p.m. at the In Memoriam Life Celebration Centre, 633419 Highway 10, Mono, Ontario. In Memoriam Funeral Services Inc. has been given the honour to serve the Singleton Family.